The teeth consist of the hardest substances that make up the human body. A complete set of teeth is crucial to nourishment and digestion. As such, the long and sharp canine are designed to pierce meat, while the wide and flat molars are built to grind food. Apart from this, a complete set of teeth is essential in the proper production of speech. Enamel. The dental enamel makes for the white outside surface of the tooth. It mostly consists of calcium, phosphate, and rock-hard mineral. Dentin. The dentin is the layer that underlies the dental enamel. It naturally consists of living cells, which produce a hard mineral substance. Pulp. The dental pulp is the sensory component of the tooth. It plays a central role in the nourishment of a still-developing tooth. The dental pulp consists of nerves, blood vessels, and soft tissues. Cementum. The cementum is structure of connective tissue that attaches the entire tooth structure to the alveolar bone. People generally grow two types of teeth throughout their lifetime: the primary teeth (otherwise known as baby teeth, milk teeth, or deciduous teeth), and the permanent teeth (otherwise known as the adult teeth, or secondary teeth). Babies are born toothless. Baby teeth start to grow into the mouth when the child is approximately 6 months old. A complete set usually consists of 20 teeth. When the child is at the ages between 6 to 4 years, the primary teeth starts falling out one by one, and are replaced by the more durable and more deeply rooted permanent teeth. A complete set usually consists of 36 teeth. Your teeth are built to last a lifetime. Sadly, some just don’t. 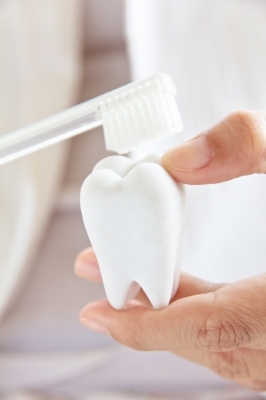 It takes healthy dental habits to preserve the natural vitality and durability of your tooth. Perhaps more importantly, preserving and promoting optimal oral health requires the help of your local Campbelltown dentist. Dedicated to upholding dental and oral wellness for you and your family, Campbelltown Dental Care provides top-notch dental treatment to the local Campbelltown community and its surrounding areas. Call us on 02 4620 5919 or book your appointment online and claim your FREE dental consultation today!